Many people enjoy sipping a cup of coffee after a meal, but if you don't mind a highly concentrated coffee beverage, you might order an espresso. Often served 2 ounces at a time, espresso is made in a dedicated machine that brews the hot drink quickly and at a high temperature and elevated pressure. The result is a hot, thick drink that's strong in taste and caffeine. A shot of espresso has an extremely low caloric content, according to the U.S. Department of Agriculture's National Nutrient Database. A 2-ounce serving of espresso contains just 5 calories, notes the USDA. 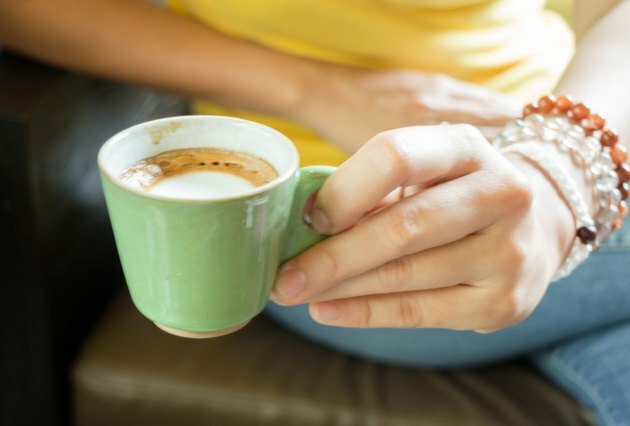 If you favor a decaffeinated version of the beverage, a 2-ounce serving also contains 5 calories. A 2-ounce caffeinated espresso contains 127 milligrams of caffeine, while the same serving size of decaffeinated espresso has 1 milligram. Espresso is a key component of other beverages at coffee shops, including lattes and macchiatos, which are often higher in calories due to added milk and sugar. How Much Caffeine Is In Tim Hortons Coffee?